You can take astronomical pictures with almost any kind of camera. You'll be able to image the Moon and planets and constellations with just a camera on a tripod. If you have a telescope, you'll be able to image the Moon, and even close-ups of craters on the Moon. To photograph deep-sky objects like galaxies and nebulae, you really need a telescope on an equatorial mount to track the stars so you can use the long exposures required for these faint objects. You can use a computerized altazimuth mount to photograph brighter deep-sky objects. But for serious long-exposure deep-sky astrophotography you need a serious telescope ! Don’t be put off trying to take astronomical pictures if you only have a small pocket digital camera –they can still capture images of stars & constellations. Ideally you need to have manual focus so you can manually set the focus to infinity. Pictures of constellations are possible and Moon pictures through a telescope. It is even possible to use mobile phones – especially for lunar pictures and some reasonable images of the moon are possible. You will need an adaptor to hold the phone to the telescope and you will find similar problems to other small digital cameras. So why are images less good with small cameras ? Resolution is often poor and noise is high. This is because the optics tend to be poorer with small cameras, especially when lens wide open. Also the sensor chips are small and are often noisy – especially in poor light, leading to grainy images. We’ve probably all noticed this with the small ‘pocket’ digital cameras in low light. But don’t be put off – you can still take some nice photos even with a small camera. But modern digital SLR cameras can overcome the problems with using smaller cameras. They have much larger sensor chips and better optics. In November 2008 I looked into buying a DSLR. I found that Canon cameras had low chip noise and were becoming popular with amateur astronomers. 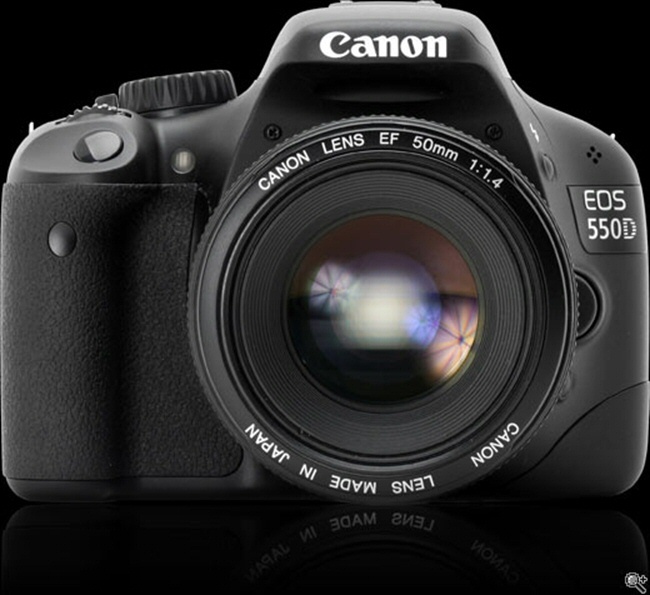 I purchased a Canon 450D which has 12M pixels on a chip 22.2 x 14.8 mm. If you want to take some really good astronomical images do consider purchasing a DSLR. Secondhand ones are available on EBay etc at a good price. A new entry level Canon 1100D costs around £270, less in USA ! But it is possible to get show good some images with small digital cameras. - Exposure – the longer the better but ….. Therefore ideally you need a camera that has a manual option that allows you to change these things. For exposure, DSLRs have a ‘bulb’ setting that allows any exposure. Many small digital cameras have a maximum exposure of 15 seconds, but this is long enough to get some good images. If you have a self-timer delay or a remote release, use that to avoid camera shake. Use your camera screen to frame your image. Do consider using computer control, which helps a lot and gives you more control over the camera and settings. Canon & Nikon cameras come with a useful programme. But there are programmes available tailored for astronomical use. I use Backyard EOS which will control the camera, including focus, image acquisition automation, etc. You also need to set the camera lens and sensitivity (iso setting). For all imaging, except the moon, use a manual setting and have the lens as wide open as possible. This will be the lowest ‘f’ ratio, maybe f2.8 etc. The camera Iso setting changes the sensitivity of the camera’s imaging chip. Use a high iso setting for high sensitivity, but there is a caution – increasing the iso setting also increases the camera noise. Noise makes the pictures look ‘grainy’. Try iso 800 or 1600 as a starter. Then you need to set the camera focus. For the moon, which is bright, you can usually rely on the camera autofocus. For everything else you need to manually focus. So you need to check your camera handbook and work out how to turn off the autofocus. You need to focus the camera on maximum distance or infinity. Some cameras have a ‘mountain’ setting for this, in which case try this. If not, point the camera at the horizon and focus manually. It might help to try this in the daytime first. For DSLRs, turn off autofocus and set the focus to infinity – again check this in the daytime first. Do use your camera screen to help with focus and zoom in to check your images are focussed by seeing if the stars are pin sharp. If not adjust slightly and try again until they are- that's the advantage of digital cameras !